The historical epic 12 Years a Slave and con-artist caper American Hustle lead the 71st annual Golden Globes with seven nominations each. Cate Blanchett had better find a gown to wear to the Oscars, although Hugh Jackman, Geoffrey Rush and Chris Hemsworth likely won’t have to worry about tuxedos. For the second time in 24 hours, Blanchett confirmed her place as frontrunner for the best actress Oscar for her roller-coaster performance in Woody Allen’s Blue Jasmine. The Australian actress was nominated for a best dramatic actress Golden Globe on Thursday along with Judi Dench (Philomena), Sandra Bullock (Gravity), Emma Thompson (Saving Mr Banks) and Kate Winslet (Labor Day). On Wednesday Blanchett (pictured above) was nominated for a Screen Actors Guild Award (SAG). The Globes and SAG Awards are the two major bellwethers for the Oscars, with nominations vital to maintaining momentum for the Academy Awards. The Oscar nominations will be announced on January 16 and the winners on March 2. 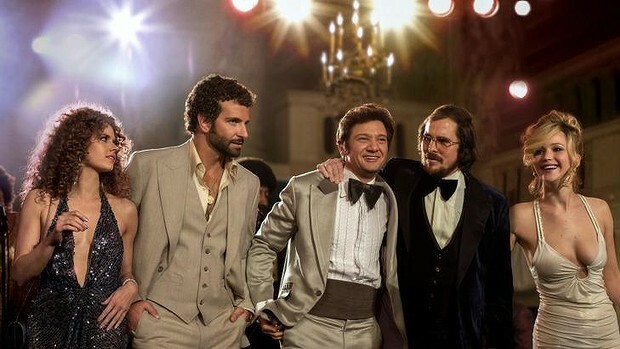 Already getting Oscars buzz: From left, Amy Adams, Bradley Cooper, Jeremy Renner, Christian Bale and Jennifer Lawrence in a scene from David O. Russell’s American Hustle, which received seven Golden Globe nominations. Just as Blanchett’s SAG and Globes nominations kept her on the right Oscar trajectory, Australian best actor hopefuls Jackman (Prisoners) and Hemsworth (Rush) and supporting actor Rush (The Book Thief) were all snubbed for Globes nods. The same happened at the SAG nomination ceremony. Oscar history says the double snubs give them little chance of scoring an Oscar nomination. Another Australian hopeful, Margot Robbie (The Wolf of Wall Street), was an outside chance for a supporting actress nomination but she also failed to get Globe and SAG nods. Globe voters liked Hemsworth’s Rush and Robie’s The Wolf of Wall Street films. Rush received a Globe drama film nomination and Hemsworth’s co-star Daniel Bruhl received a supporting actor nomination. 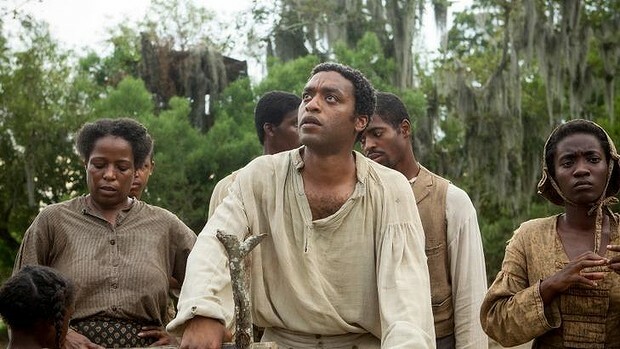 Chiwetel Ejiofor, centre, in a scene from Steve McQueen 12 Years A Slave, which also received seven Golden Globe Nominations. The Wolf of Wall Street was given a nomination in the musical-comedy picture Globe, despite the film being neither a comedy or musical, while the film’s star Leonardo DiCaprio also picked up a comedy-musical actor nod. In the TV categories, the star of Jane Campion’s TV mini-series Top of the Lake, Elisabeth Moss, added a Globe nomination to her SAG nomination. The 71st annual Golden Globe Awards will be held in Beverly Hills on January 12. The 20th Annual Screen Actors Guild Awards will be held in Los Angeles on January 18. In other major Globe categories the best actor-drama nominees were: Chiwetel Ejiofor (12 Years A Slave); Idris Elba (Mandela: Long Walk To Freedom); Tom Hanks (Captain Phillips); Matthew McConaughey (Dallas Buyers Club); Robert Redford (All Is Lost). Best Actor in a musical or comedy film: Christian Bale (American Hustle); Bruce Dern (Nebraska); Leonardo DiCaprio (The Wolf of Wall Street); Oscar Isaac (Inside Llewyn Davis); Joaquin Phoenix (Her). Best Actress in a musical or comedy: Amy Adams (American Hustle); Julie Delpy (Before Midnight); Greta Gerwig (Frances Ha); Julia Louis-Dreyfus (Enough Said); and Meryl Streep (August: Osage County). Best film drama: 12 Years A Slave; Captain Phillips; Gravity; Philomena; and Rush. Best musical or comedy film: American Hustle; Her; Inside Llewyn Davis; Nebraska; and The Wolf Of Wall Street.